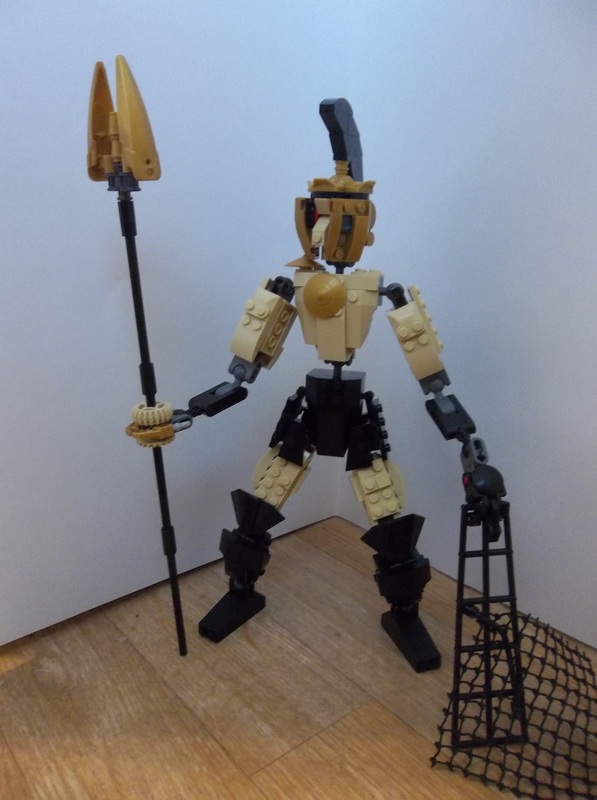 So I built a Roman gladiator. Well, technically gladiator denotes a warrior that fights with a gladius, or Roman short sword, and this guy is armed with a trident, but the word has come to refer to any arena fighter from the Roman era. 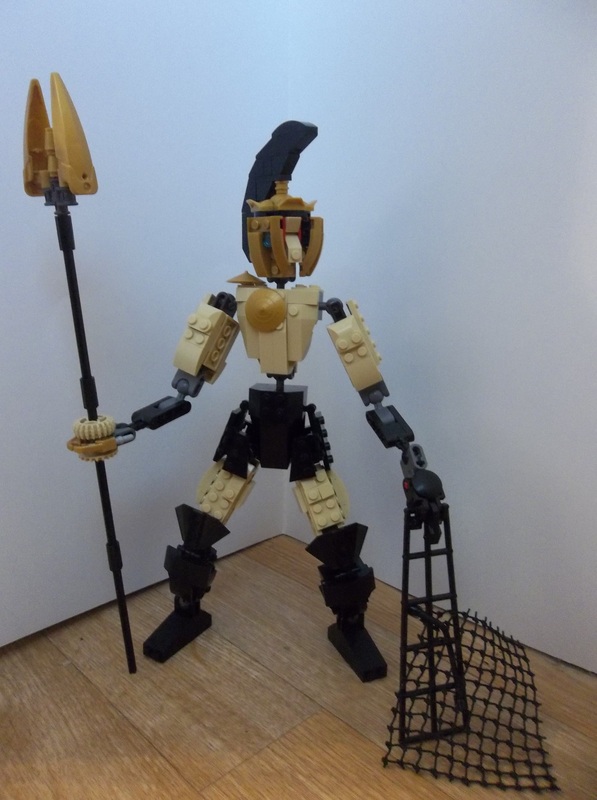 This type of gladiator, fighting with a trident and a weighted net, was called a retiarius. Apparently based on a type of ancient fisherman, the retiarii‘s mobile, hit-and-run style of fighting placed them towards the bottom of the various gladiatorial styles’ pecking order. The crowds apparently favoured styles that would get in close and trade blows, not hang back and jab with a spear. Technically, retiarii didn’t wear helmets and were armed with daggers as well, but I didn’t find this out until after the model was complete. 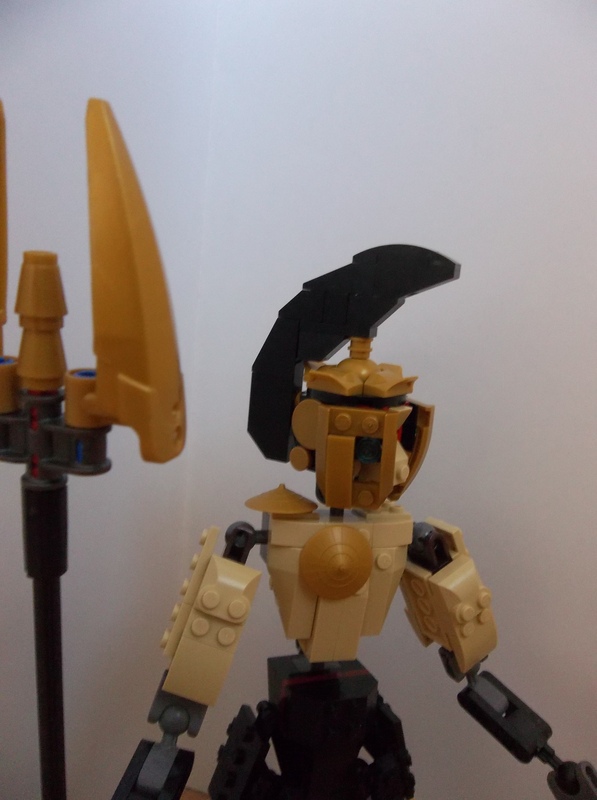 However, I probably would have taken the historical liberty of putting a helmet on my gladiator anyway; I don’t think he’d look nearly as good without his helmet. For once I’ve made a more effective kilt or loincloth-type wrap rather than just put up with the problematic wasp-waist of balljoint connections. Between that and the knee-high boots, I’ve managed to effectively hide the balljoint connections on the legs quite well. The arms, less so. The black and grey parts are supposed to represent gauntlets, but they work only so-so. Especially the hand grasping the trident, which proved incredibly difficult to make work without being totally oversized. 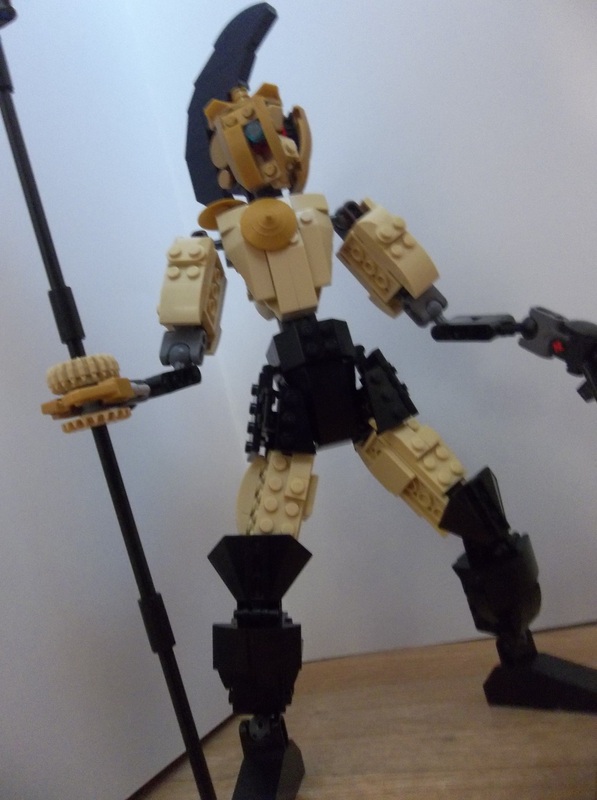 A Bionicle or CCBS figure hand would be just the trick here, but I don’t have one. What I’ve done is probably as good as I can manage without. Hopefully it’s not too much of a distraction. The other hand, the one grasping the net is better. The forearm still looks a little funky, but the three fingers grasping the rigging element of the pseudo-net actually looks fairly naturally posed. The post title, of course, is the Latin for “We who are about to die salute you”. It’s not a very seasonal creation in terms of the one celebrated by the majority at this time of year, but the first of November is All Saints, and so many of the First Century followers of Christ were put to death in the arena that it makes a sort of sense. Yeah. That’s my excuse. 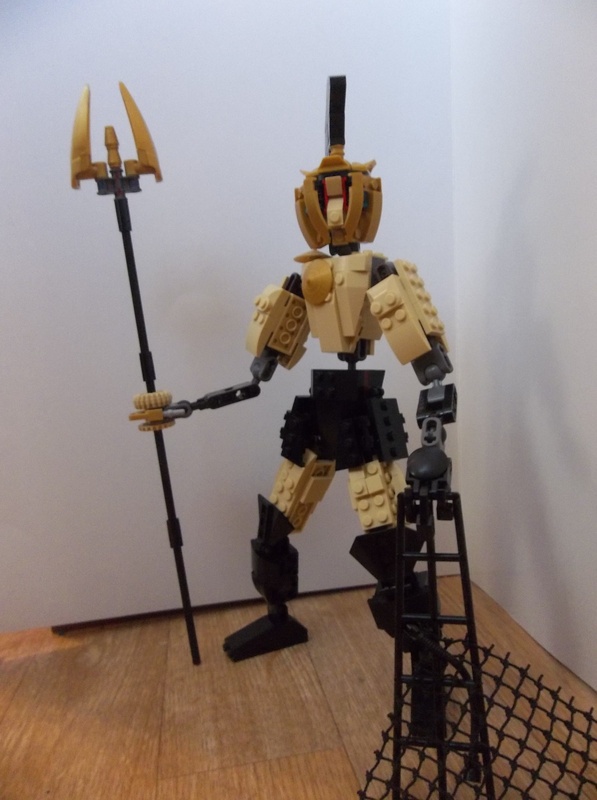 This entry was posted in Creatures, Seasonal and tagged All Saints, Gladiator, Lego, MOC, Retiarius on October 31, 2017 by geoffhorswood. 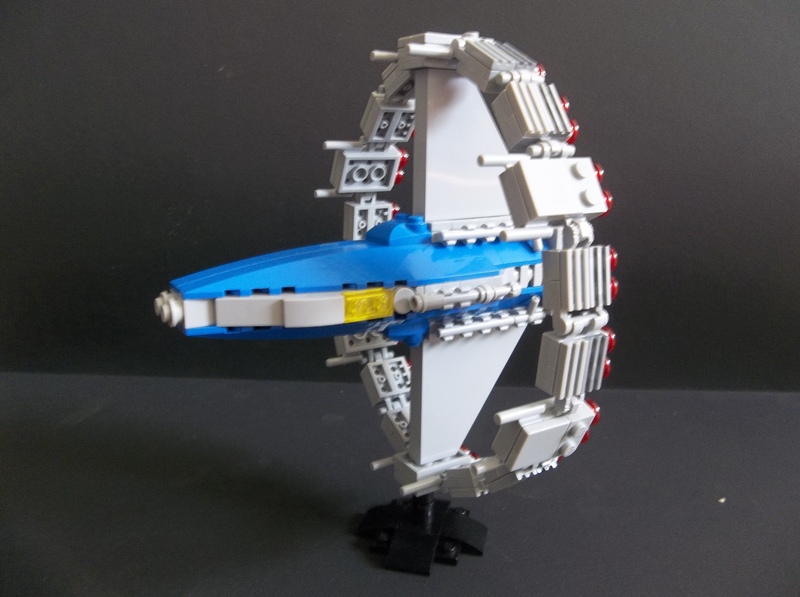 You may have noticed, but I find mythology a fascinating source of names for my various LEGO spaceships and mechs and rovers and whatnot. 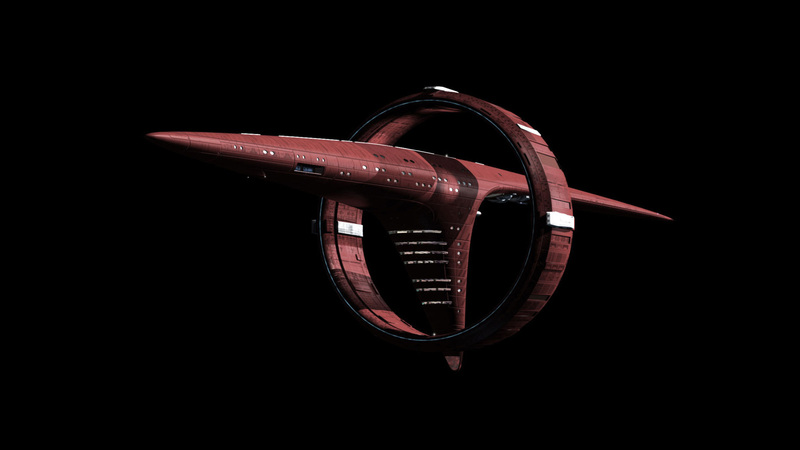 And this small starship is no different, being named the Gyges-class cruiser. The Ring of Gyges was a magical artifact from Greek mythology, mentioned by Plato in his Republic. Purportedly owned by King Gyges of Lydia, a Greek colonial province in what is now mainland Turkey, the ring granted the power of invisibility, much like Tolkien’s One Ring did. Given its ring-shaped drive section, it almost had to be named after some kind of mythological or fictional ring or other. 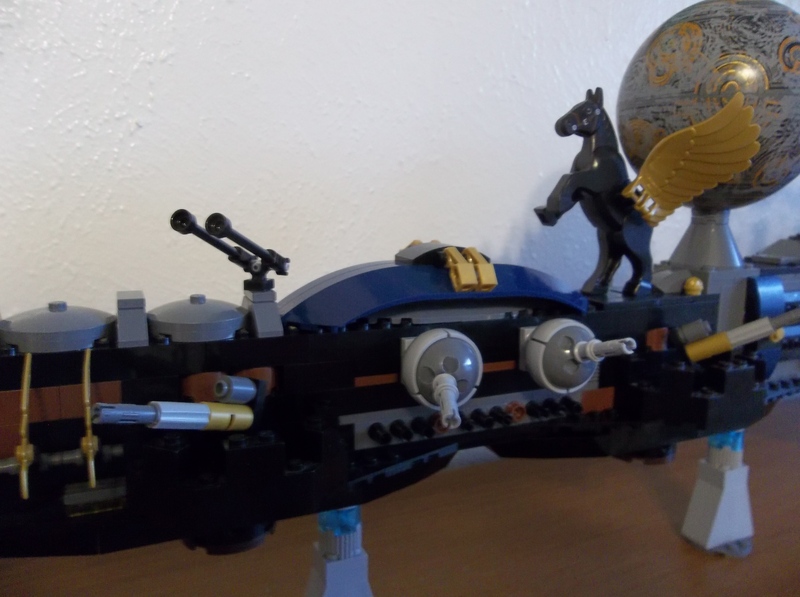 Nazgul-class would work for a Blacktron vessel, but this one is in Classic Space colours, and it just doesn’t work. It was almost Nibelung-class, or Avebury-class after the British stone circle that was constructed contemporary with the Great Pyramid. I suppose the main hull of the ship is even somewhat menhir-shaped, so that would have worked quite well. However, I seem to have formed a connection in my mind between Classic Space designs and Greco-Roman mythological names; somehow they just seem right, you know? Ergo, Gyges. 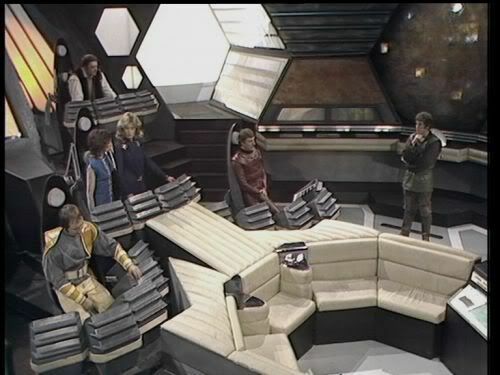 The oval ring section rather reminds me of the Odyssey, heroic starship of the awesome 1980s Greek-mythology-in-space cartoon TV series Ulysses 31, except turned on its side. 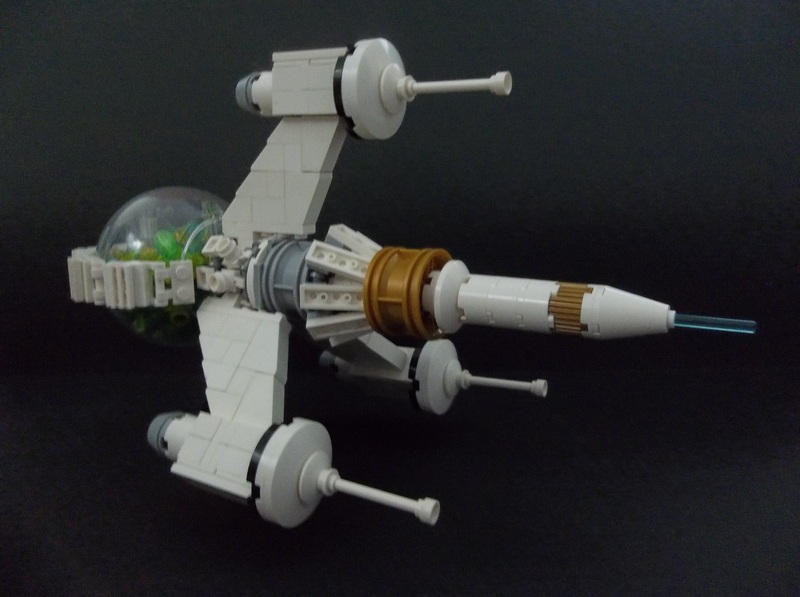 The rest of the ship is very different, though; more like Star Wars’ Jedi Starfighters with their hyperdrive rings. 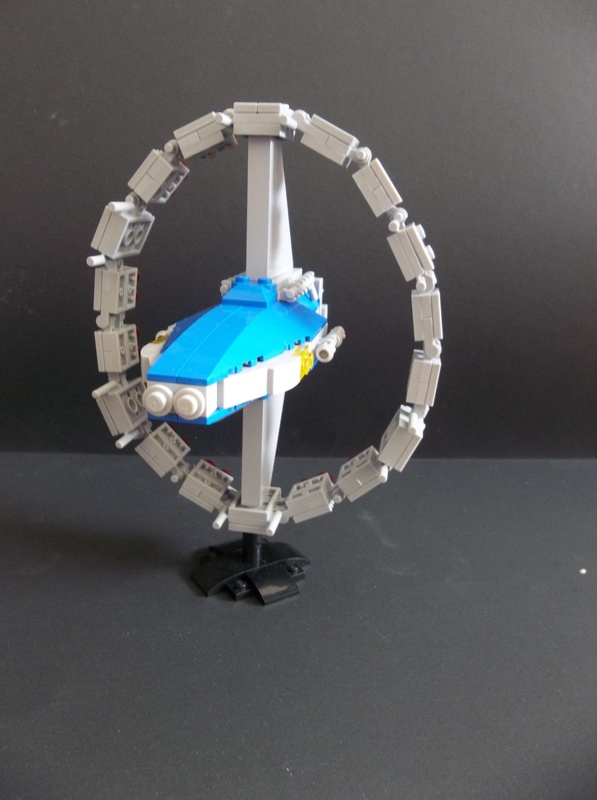 If there are other ring-shaped starships or starships with ring-shaped drive sections out there, I’d be interested to see them. Like I said, I’m a sucker for their implicit coolness. 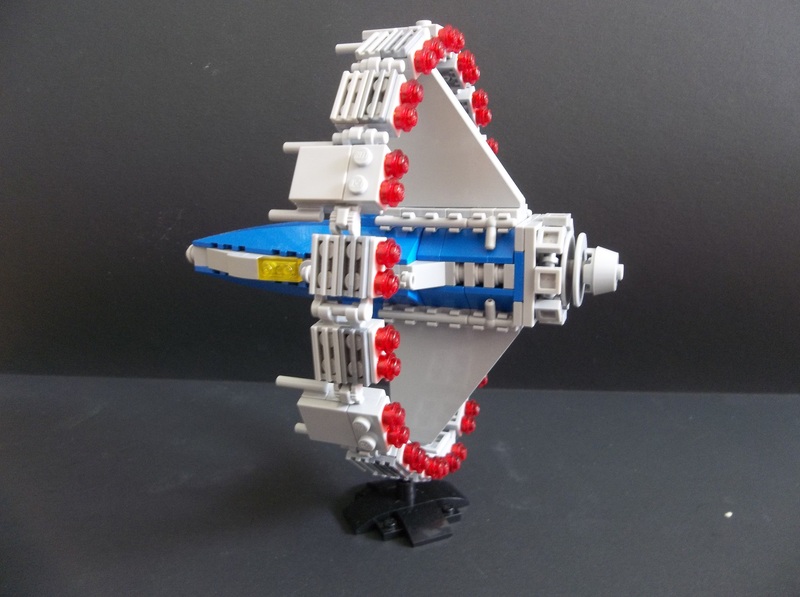 Gyges is probably about the same length as a World War 2 cruiser or battleship if it were Real Life, with the trans red studs all around the ring representing the stardrive. I’m suspecting it uses something like a point-to-point artificial wormhole generator or similar; mostly because most of the sci-fi I’m familiar with uses something else: Star Trek has its warp drive; Star Wars and Babylon 5 utilise hyperspace; Stargate SG-1 used point-to-point gates, and Halo has some kind of foldspace, if I recall correctly. 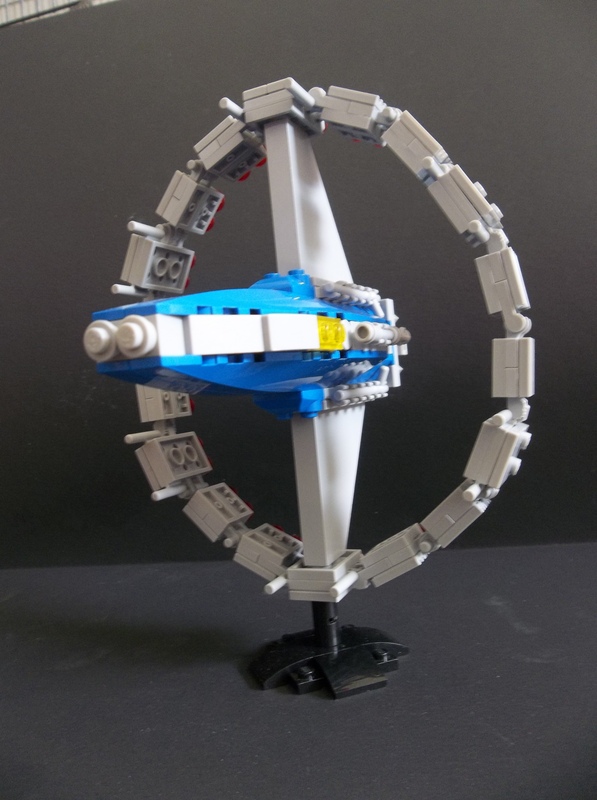 Using wormholes as stardrives sounds both plausible and uncommon, so it’s recommended on at least two counts. I have no idea whether it’s even armed. The only obvious weapon candidates are the bar projections on the ring section and the twin cannonlike attachments on the sides of the main hull, but I’m thinking the bar projections around the ring are concerned with the wormhole drive’s functionality, and the “cannons” on the main hull just seem more like some sort of sensors or probe launcher. Probably it has at least defensive lasers, but I expect they’re too small to see at this scale. 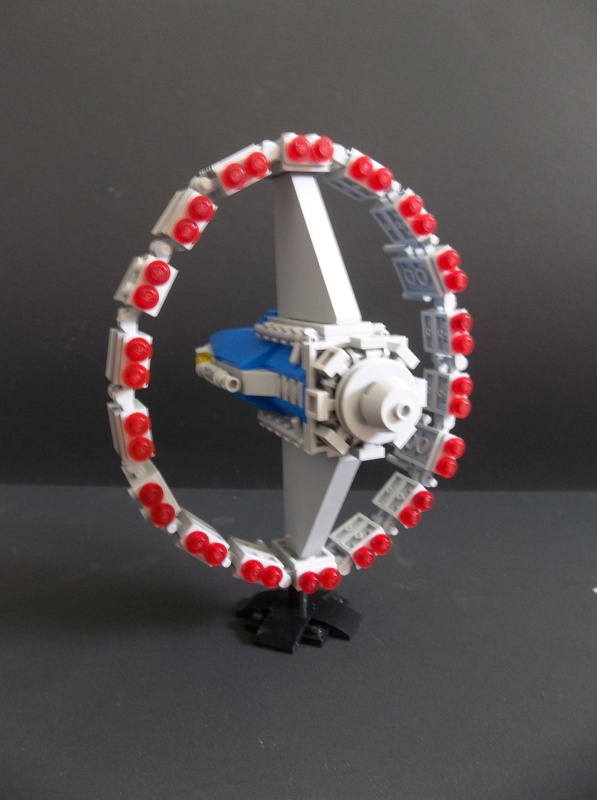 This entry was posted in Lego Classic Space, Lego Space and tagged Lego, Microscale, MOC, ring drive, Spaceship, Starship, Ulysses 31, Vulcan Cruiser on October 24, 2017 by geoffhorswood. Believe it or not, this creation was originally going to be a steampunk mech. 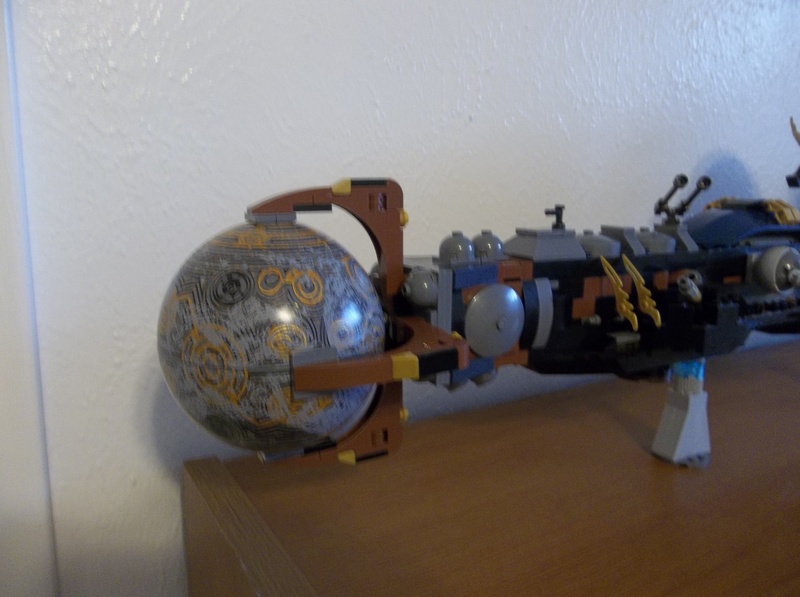 I was inspired by the large mechs of the Ninjago Movie to build a big mech of my own with a steampunk twist, using my twin Coruscant planet elements as boilers or fuel tanks. Alas, actually beginning to build the thing I realised that I wasn’t building remotely big enough and the planet boilers looked oversized and ridiculous. But modifying the attachment setup I’d intended to use for the planet sections as twin boilers, I found a rather nice-looking claw-held arrangement for a single planet sphere forming under my hands. And while it wasn’t really going to work as part of a steam-mecha, it had “steam-powered space dreadnought” written all over it in large, friendly letters. And who am I to argue with Fate? Continuing to build, it was obvious fairly quickly that my limited stocks of brown weren’t up to building the size of spacegoing ironclad this was shaping up to be, so I added black into the mix. Black and dark grey with pearl gold enhancements was the colour scheme I had in mind for the hypothetical “Dark Pegasus” SHIP I’ve been alluding to the planning of for some time now, and I just bought, among other elements, the pearl gold wings I need. Could I really pull it off? Build the SHIP I’ve been contemplating? And as a steampunk build? Dark Pegasus wasn’t conceived as specifically a steampunk starship, but it always had a definite baroque flavour. How else was I going to get away with the massive painted Pegasus figurehead that gives it its name? But as conceived it was always fairly easily steampunkable. I decided to give it a go. The placement of the horse element, which I’ve been wanting to use in a spaceship build for years now, moved from my original concept of a bow-mounted figurehead to a piece of decorative statuary atop the main hull. The claw-held planet element prow necessitated some redesign work, but the result is still channeling the same spirit of a large mostly-black spaceship with the sort of approach to decoration that makes a figurehead reasonable. Many of the other design elements of my original idea find their expression here not substantially altered. The gold wings, reprising the flight membranes of the Sensei Wu dragon in black rather than white, still grace the flanks of the warship. 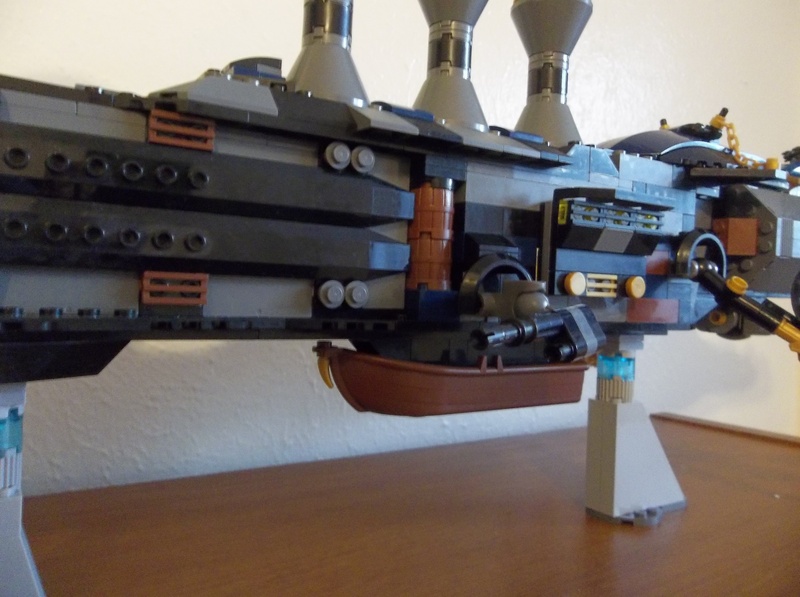 The massive cannons of the ship’s mighty broadside are still the cup-and-ball sponson mounts I had envisaged. Various portions of the vessel still bristle with pearl gold decorative elements: gleaming brasswork enhancing the appearance and potentially the functioning of the ship. In order to surpass the 100-stud official SHIP barrier, I needed more than just black and gold as livery colours. The dark grey and brown are structural; the latter perhaps signifying a more tarnished bronze, or even wood. Without adding too many colours, I needed to eke out my supply of black elements to achieve SHIP status. Though I’d initially contemplated dark red as a suitably dark, barbaric addition to the colour palette for the original non-steampunk Dark Pegasus, I decided when it came to it to use dark blue instead. It’s a darker colour than dark red, and the combination worked well for Ninjago’s ghost faction. In lower light conditions it even looks like pure black. The Revised Steampunk Version of the Dark Pegasus seems to have broken my usual habit of wanting to build a creation all in one session, too. 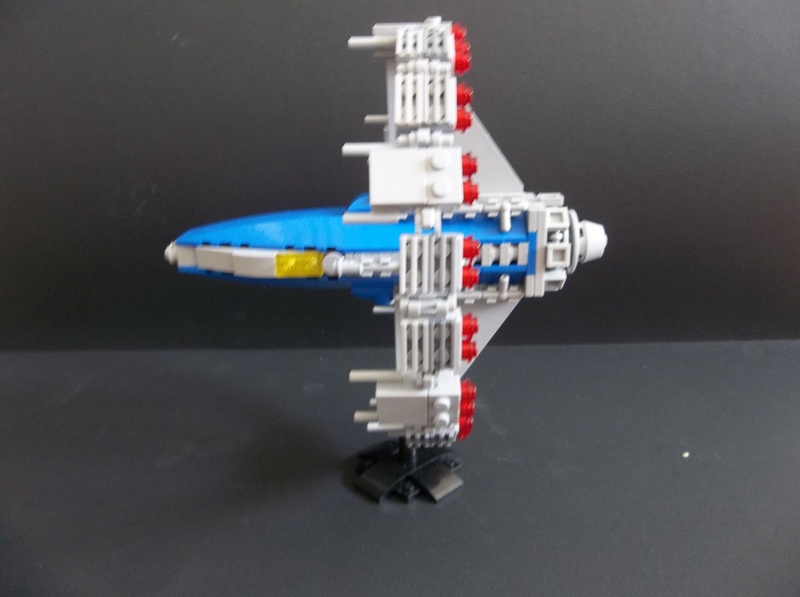 Built over a period of most of a week, it’s all the better for it, as I took several days mentally planning various things out in order to get everything right. 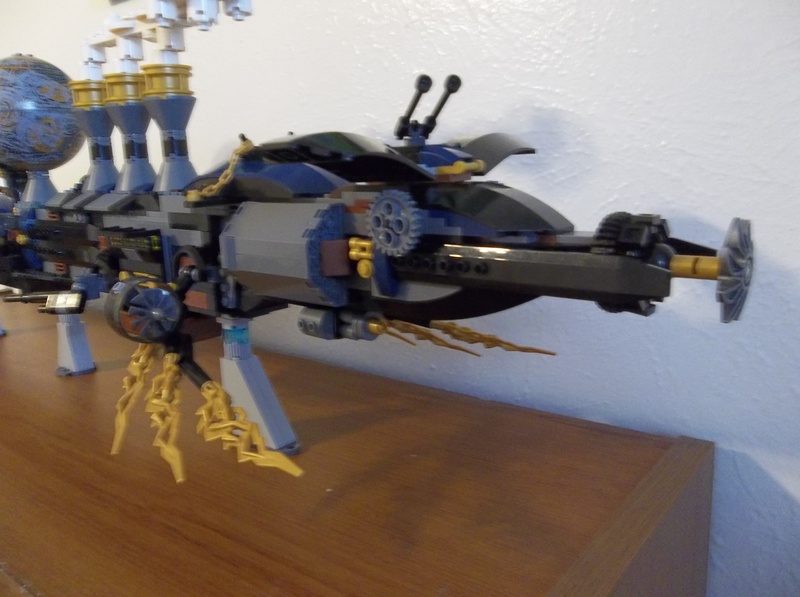 At 106 studs (39 3/4 inches or 101cm) long, Dark Pegasus is my second official SHIP and my first in the steampunk genre. Apparently even in Steampunk I’m still Benny enough that my impulse is to Build A Spaceship. 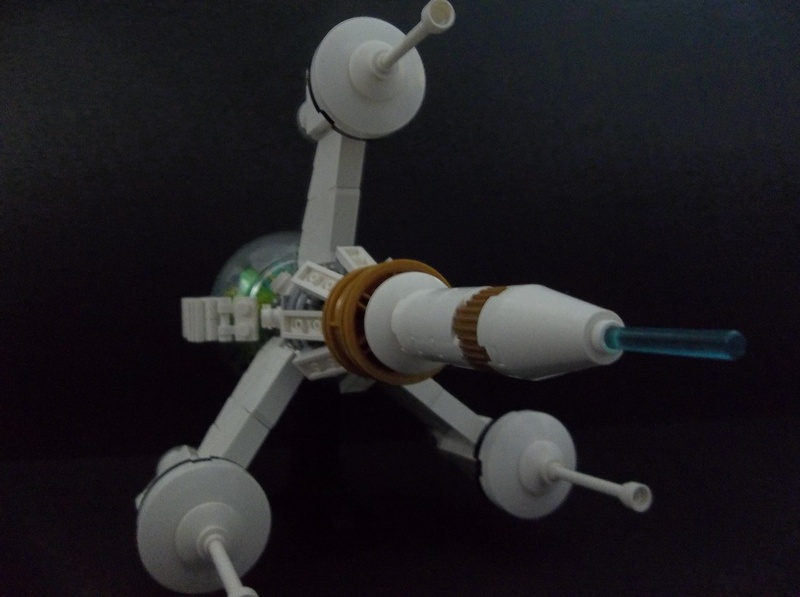 Propelled by three aetheric propellers and armed with a variety of heatray weapons, space howitzers and long guns, HMS Dark Pegasus is one of the Minotaur-class fleet flagships of Her Majesty’s Royal Space Navy. Each one decorated with a massive painted steel statue of its namesake, the seven ships of the class serve as flag vessels of the seven principal fleets of the RSN, cowing their adversaries as much with the spectacle of their impressive visual design as with shells and heatrays. 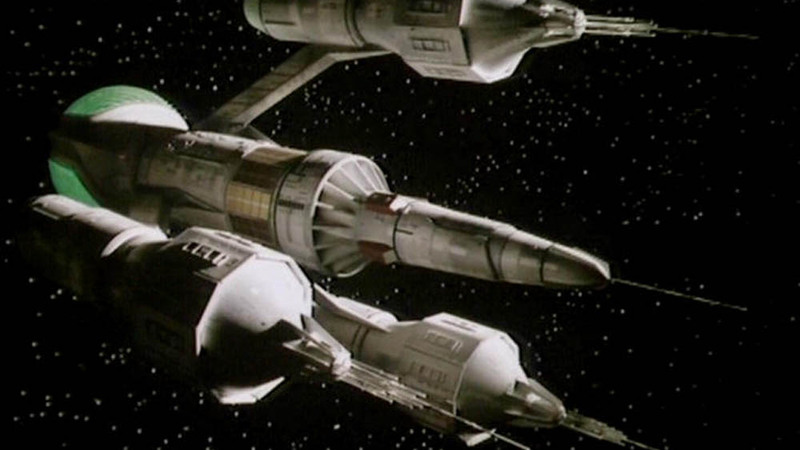 Dark Pegasus’ navy blue trim on her space-black RSN hull paint signifies that she is the flagship of the Sixth Fleet, based in the Uranian planetary sphere and headquartered in Her Majesty’s spacedock in orbit around the moon Oberon. The underslung shiplike structure is a heavy landing-craft for use on the chill, oily seas of Oberon, enabling supplies and personnel to be easily transferred between the Fleet and the surface. Most of the Uranian moons have some sort of liquid surface [OOC: at least in the altered reality of this steampunk-space universe], so the maritime form of ship’s boat is the customary type in the Sixth Fleet. 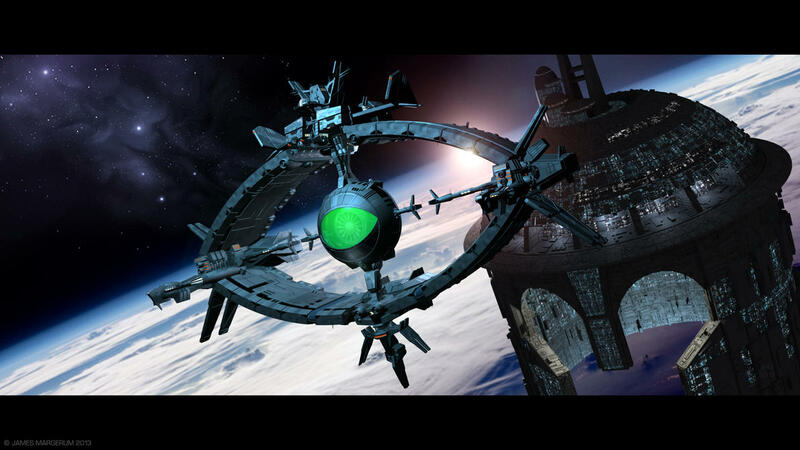 The ball-like structure at the prow of the vessel is often assumed to be decorative, like the similar globe atop the central hull, but in fact both are useful equipment: nodes of the ship’s sphere-penetrating Bassenfeldt drive allowing the ship to pass the aetheric barriers between the orbital spheres of the Sun’s family of planets. 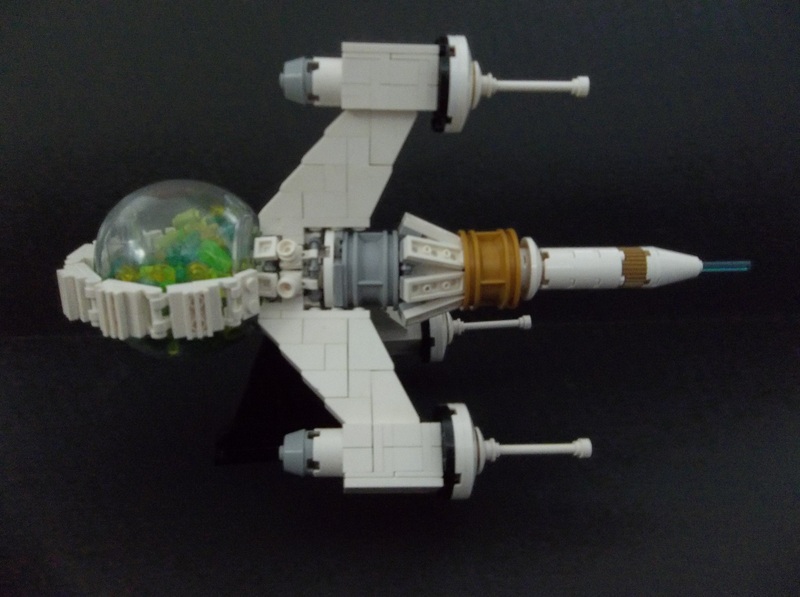 This entry was posted in Lego Space, Steampunk and tagged Lego, MOC, SHIP, space battleship, Spaceship, Steampunk spaceship on October 14, 2017 by geoffhorswood. Readers of my other blog may remember that our household recently acquired a cockatiel. Chewie likes LEGO. Specifically, Chewie likes to chew all the tiny elements that look like brightly-coloured food. Initially we thought Chewie was a boy bird, but a couple of weeks ago she started laying eggs. So she’s a Chewbeaka, not a Chewbacca. Apparently tiels kept as pets will normally lay eggs a couple of times a year even without a male bird to fertilise them, but they say you have to let them sit on the eggs for around 21 days otherwise they’ll keep on laying trying to replace the lost eggs, and that’s bad for their health. Anyway, wanting to build something that wasn’t a spaceship I was casting around for something to build when those long grey rotor blade elements caught my eye and made me think of tail feathers. LEGO Chewie doesn’t look nearly as good from the front, somehow, but I’m unsure what I can do about it. I think it’s that the head is too wide, or possibly the body is too small relative to the head, but from the side it looks fine. Judicious selection of camera angles and you’ll never know. Shhh! 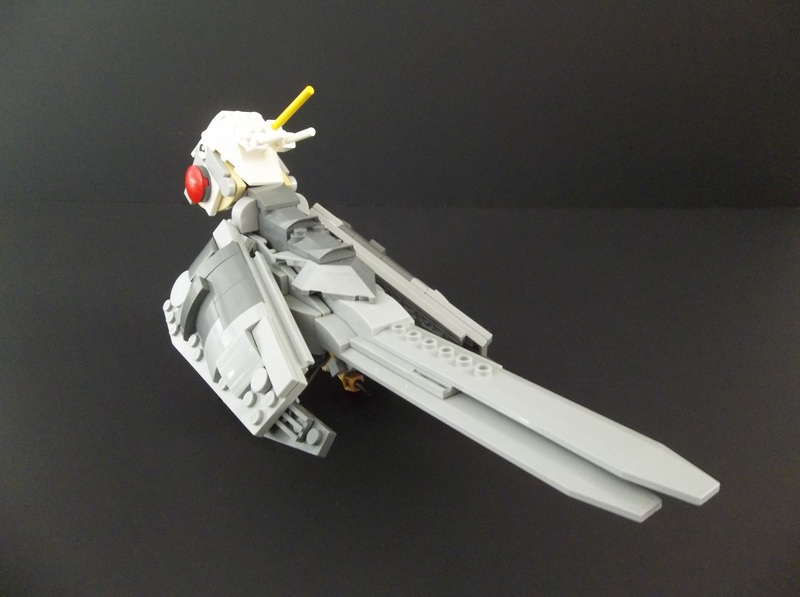 The wings move quite a bit but they aren’t the most stable or robust design, so they have a tendency to fall off. All hail AFOL building techniques. The head moves… incrementally. 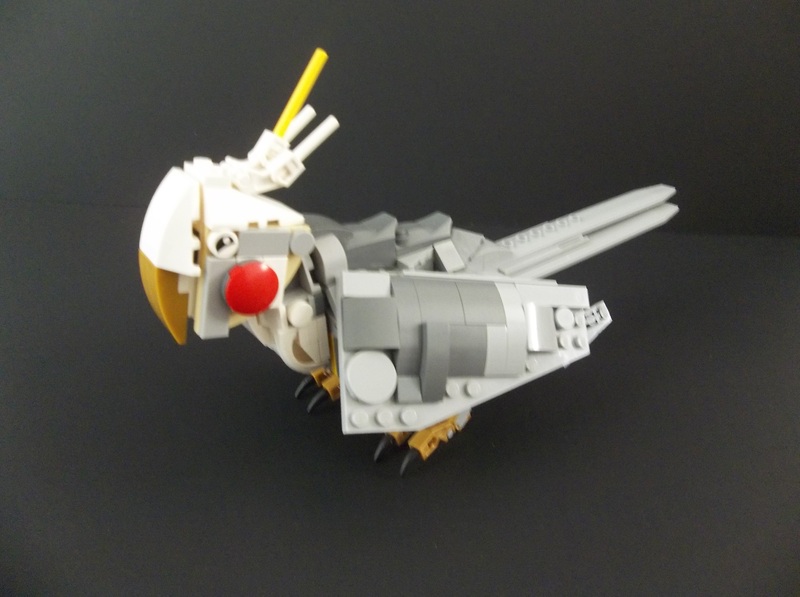 There’s a balljoint in there, but the visual requirements of building a cockatiel necessitated an extremely restricted amount of movement. 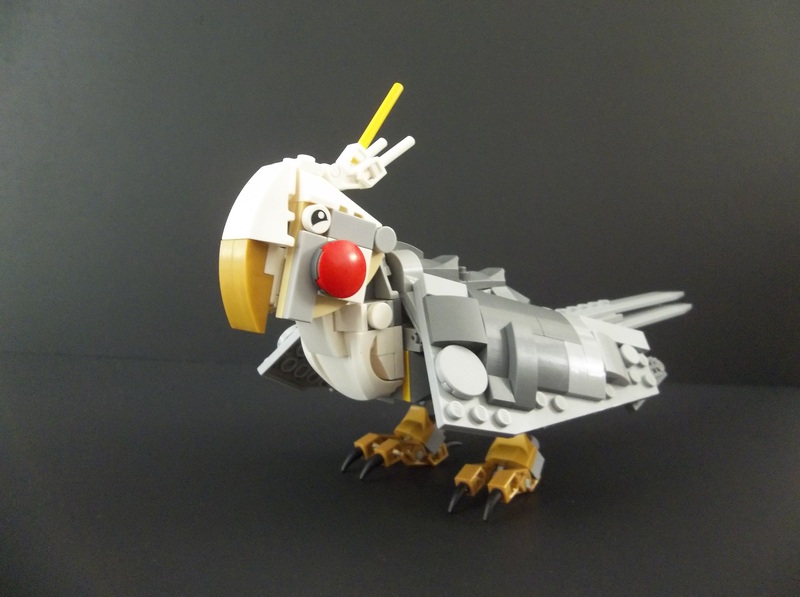 If I had any light yellow, a cockatiel build would have been the perfect place to use it, but I don’t. 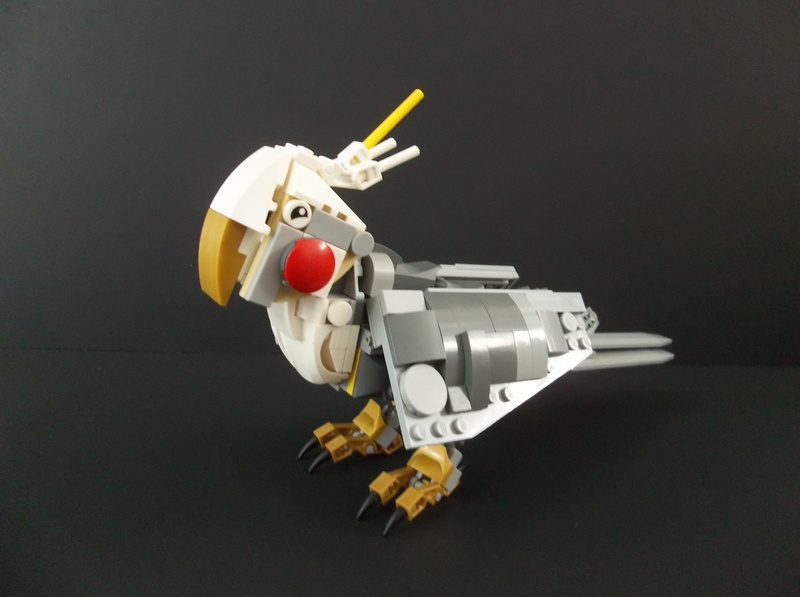 Even using regular bright yellow would have meant a very different, studdier and more angular build, but thankfully cockatiels are variable enough in plumage that the LEGOtiel is still basically accurate. 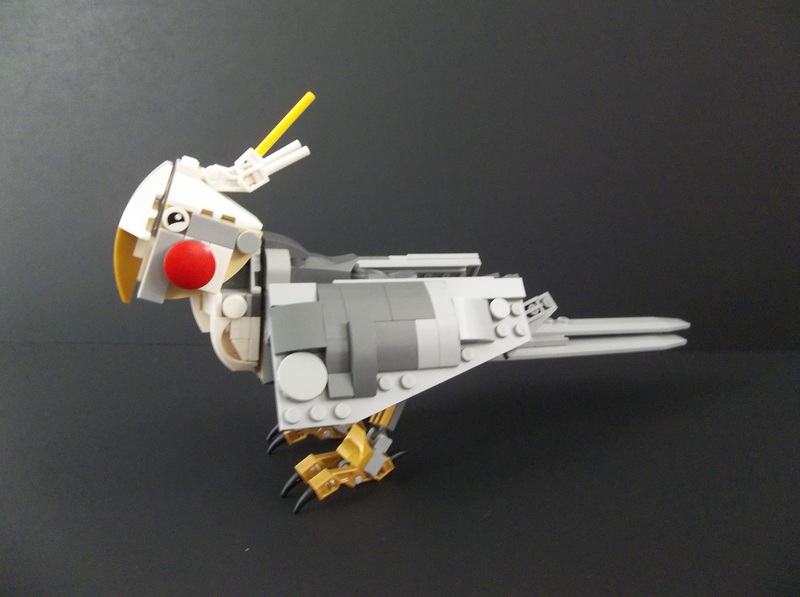 This entry was posted in Creatures and tagged Birds, Cockatiel, Lego, LEGO Creatures, MOC, Pets on October 9, 2017 by geoffhorswood. The giant Rebel ion cannon of planet Hoth was iconic enough that it got a Ralph McQuarrie painting all to itself. Not bad for less than two minutes of screen time in The Empire Strikes Back. 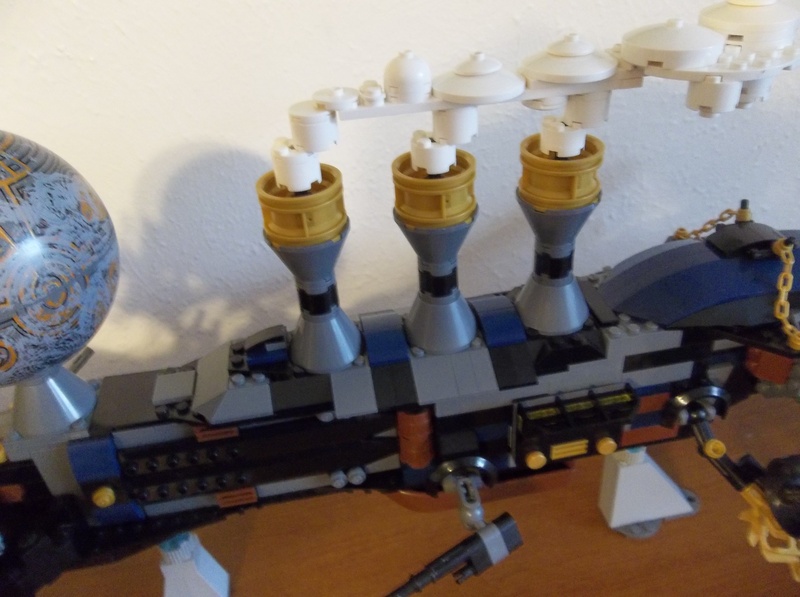 It occurred to me that the cup-and-ball cannon mounts might make a pretty good microscale version of the Star Destroyer-disabling planetary defence cannon. 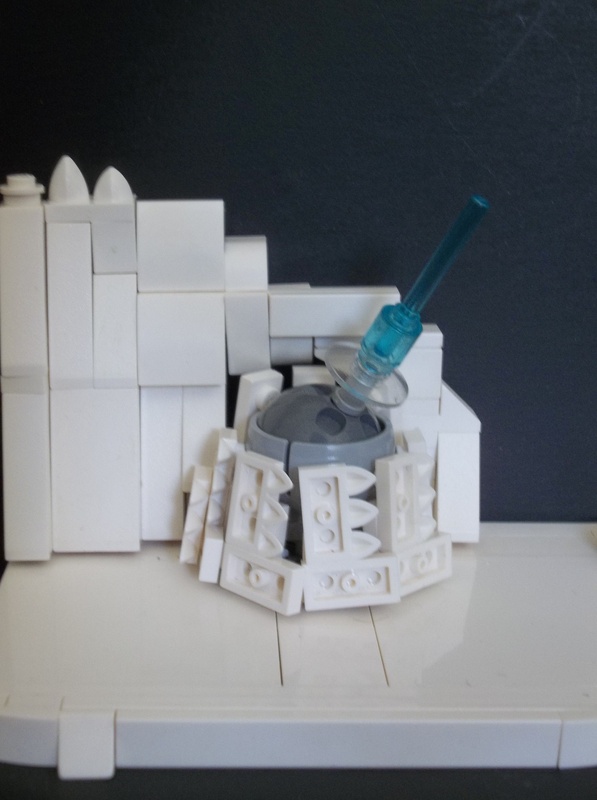 All that was needed was to enclose it somehow in an ice-carved turret. 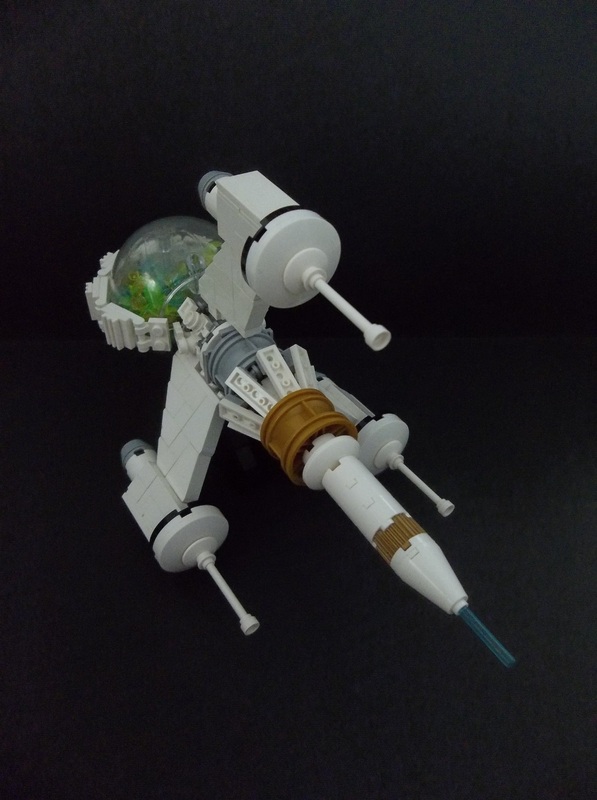 I think 2×3 wing elements might have worked better for the enclosing turret, but I don’t have enough of those in white, and any other colour would look silly. 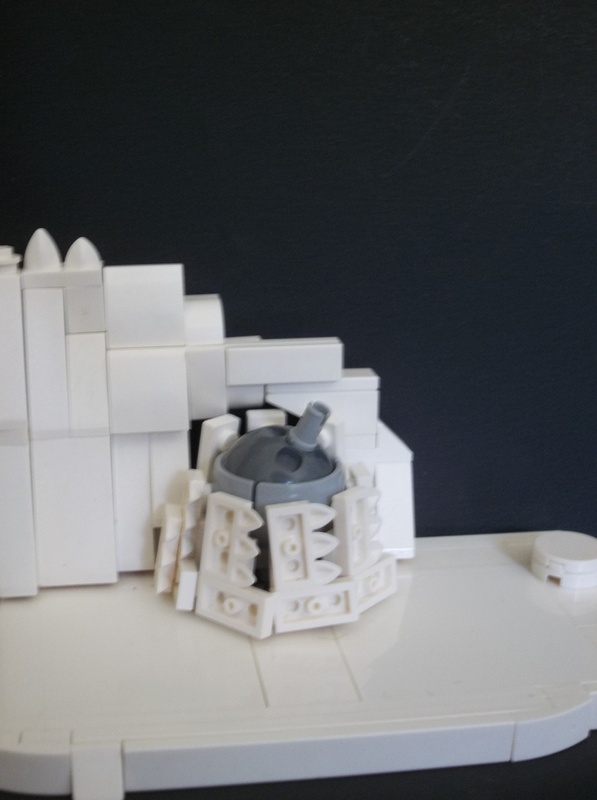 Even with all the white in use on my Ice Planet battle fleet, I still had enough left over to build a small baseplate and surround. 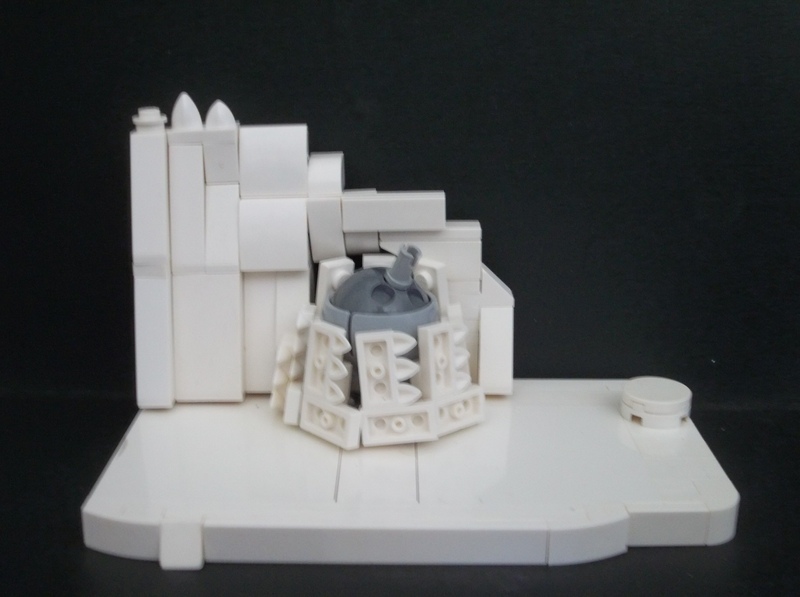 And I put some transparent bricks together to simulate its firing, too. 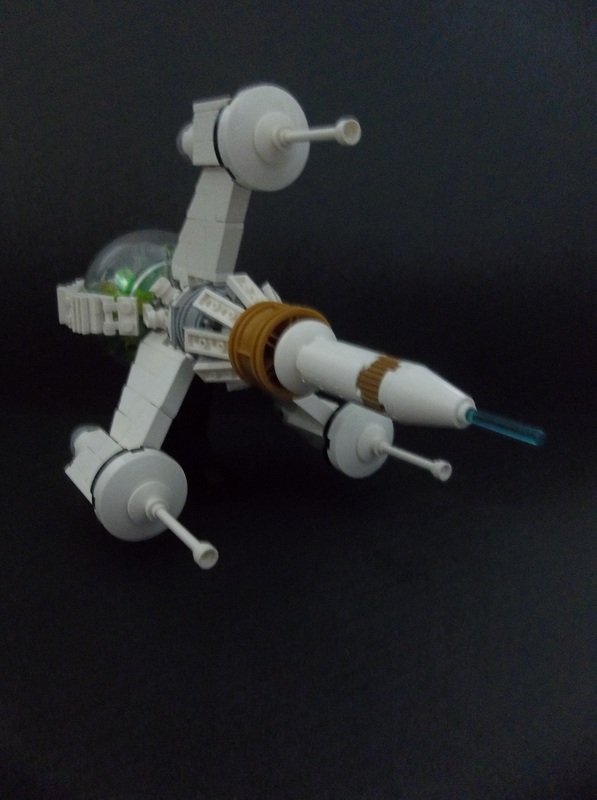 This isn’t a huge or complex model, and I’m too impatient to wait for a Bricklink order of 2×3 left wings to make it look better. The toothed elements aren’t too bad; at least they add to the icy look. 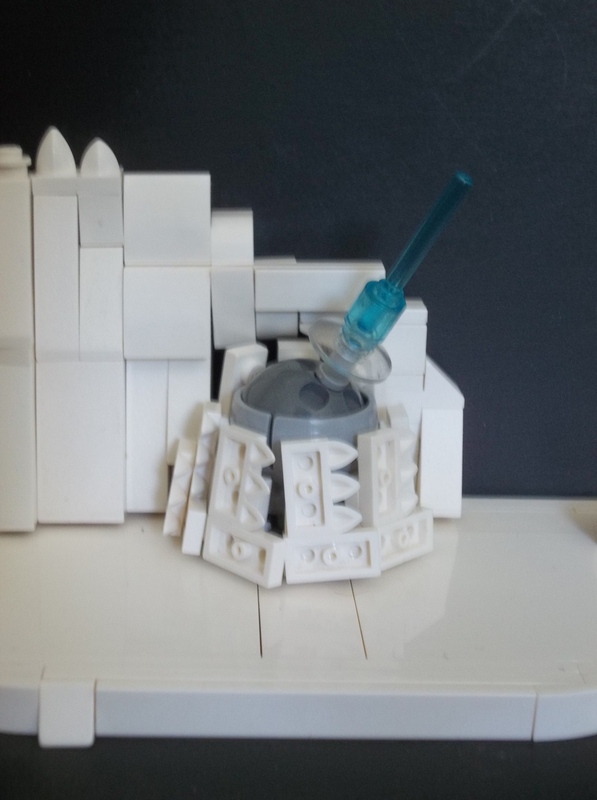 This entry was posted in LEGO Star Wars and tagged Hoth, Ion Cannon, Lego, MOC, Star Wars, The Empire Strikes Back on October 5, 2017 by geoffhorswood. I have no idea why Stegosaurus is my favourite dinosaur. I mean, I love my heroes to be men and women of wit and skill rather than sheer mindless brawn. The mentor/wise counsel type characters are often personal favourites. How does that work to then turn around and love a dinosaur that has a brain about the size of a chicken mcnugget? 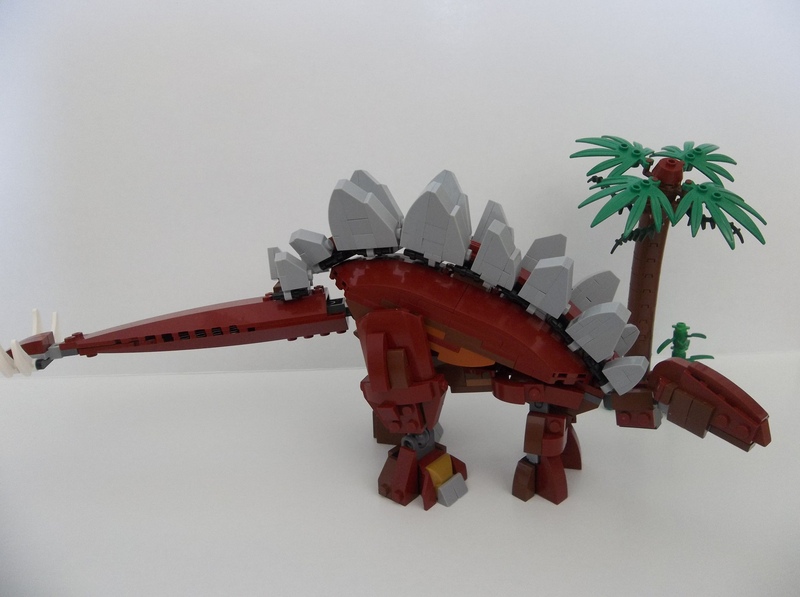 The Stegosaurus seems to fit right in with that. It’s been theorised that since the Stegosaurs’ bony back plates were attached to the skin rather than jointed to the skeleton, that they might have been far more mobile than previously suspected. It’s currently a controversial theory, as I gather, but I must say I rather like the idea that the plates might have folded down to protect the creature’s back and sides in combat. Computer reconstructions of the Stegosaurs also show that they had far more flexibility in their vertebral columns and tails than most other dinosaurs – an adaptation for swinging that thagomizer around? Yes, there’s a specific word for the stegosaurs’ clusters of tail spikes. Because they’re that awesome. So, extreme flexibility, special weapons, origami armour – this is sounding more and more like a sort of dinosaur Ninja. I can respect that. You should, too. And as for the small brain, maybe it just didn’t need a large one for its lifestyle. It’s a herbivore. How much brain does it take to sneak up on a tree fern? Dinosaurs are supposed to be related to birds, and avians seem to be quite capable enough even with tiny brains. No-one messes with an ostrich, and that’s a pea-brain. 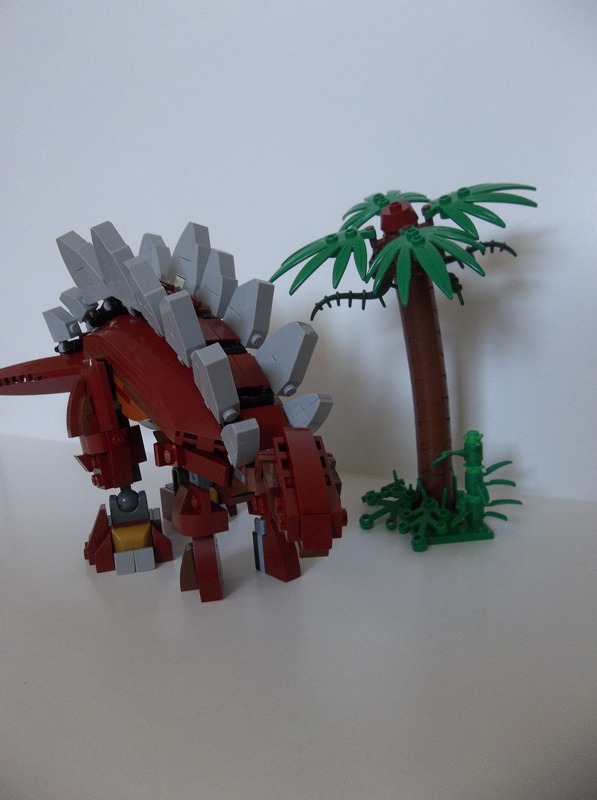 So I built a Stegosaurus. The tail’s not nearly as flexible as it ought to be, and the legs are a little chunky, but I actually managed to stagger the plates a bit. And they’ll fold down over the back for that origami armour look. 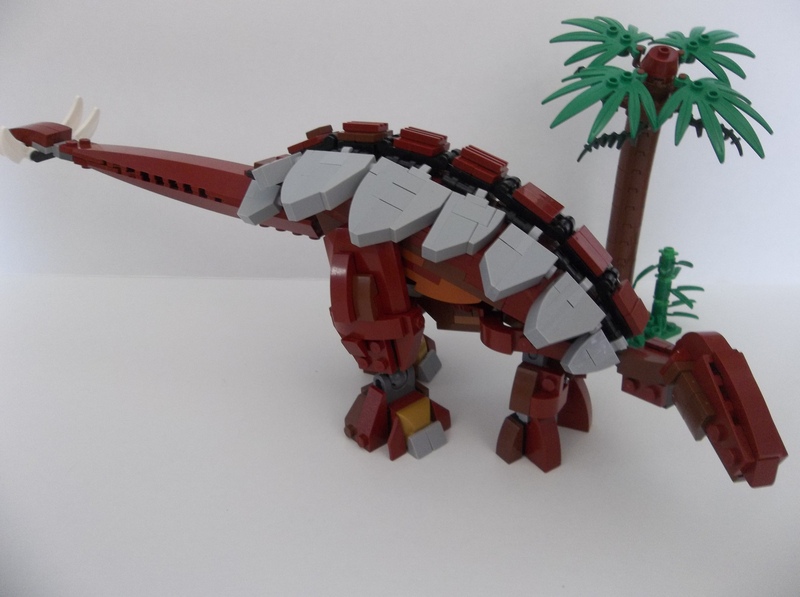 Only Stegosaurus itself of all the stegosaurs has its back plates staggered. In every other member of the family they’re neatly paired. I have no clue why that is. 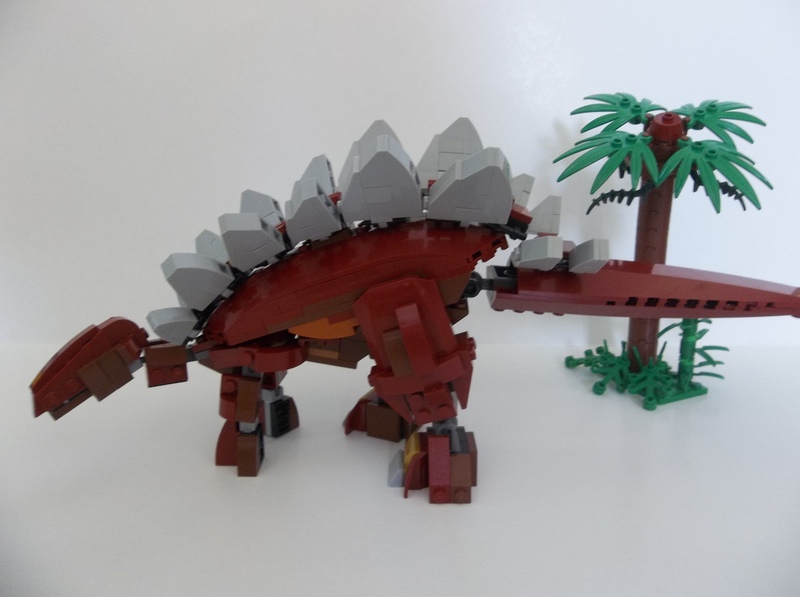 This entry was posted in Creatures and tagged Dinosaurs, Lego, MOC, Stegosaur on October 3, 2017 by geoffhorswood.